Usually, I’d like to think I know what’s lurking in my backyard. Then I came across this thing and realized I have not a clue. This unfortunate looking fish is called the northern stargazer fish, which sounds romantic, but it’s definitely not. Actually, this fish is the antithesis of romance. The northern stargazer buries itself in the sand of the ocean floor and lies in wait for its prey. When it senses food is nearby, it can use a jolt of electricity to stun its prey and subsequently devour it. It also has a gigantic mouth, which, lucky for its camouflage, no prey can identify quickly enough. Once in the vicinity of its gaping pie hole, no small fish nor crustacean is safe as it quickly expands and devours it whole. 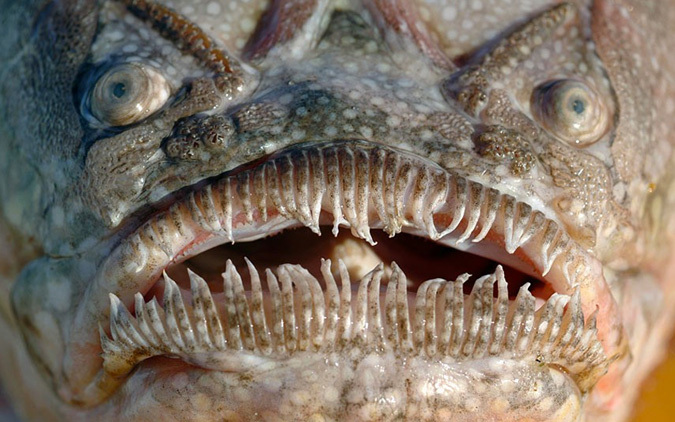 You might think, “But how could any fish not spot something so ugly?” Well, the only thing the stargazer reveals are its eyes which are situated atop its rugged, spotted, blackish brown body, thus making it nearly invisible to a passerby. Since light is at a premium where the stargazer hunts, it’s camouflaged quite well making dinner easy to catch, as you can see below. So, romantic this stargazer is definitely not. While its name insinuates a quiet night admiring the beauty above, its actions suggest you, if you were a small fish or crab, should be nowhere nearby. If you live roughly between North Carolina and New York on the east coast of the US, or frequent those Atlantic waters, there is a chance you could meet this little fella. Though I wouldn’t be surprised if you didn’t as it typically dwells at depths of up to 120 feet and hunts in those deep, dark crevices in which it’s camouflaged. Aside from being hard to spot, the northern stargazer fish does have another method of defense. The same electric stun it administers to prey can also be used to defend itself against larger predators. Those who wish to make the stargazer their lunch might come upon a shocking surprise as this curious cameraman found out.